That packet of vegetable seeds may look dry, brittle and lifeless, but seeds are very much alive. Inside each plant seed is the embryo of a future plant. However, seeds do not remain alive forever. How long seeds remain viable depends on the type of seed and how well it is stored. Most vegetable seeds remain good for about 2 - 3 years, but some, such as onions, deteriorate within a year and others such as lettuce, can successfully sprout after 5 years. Here are some average years of viability for well-stored vegetable seeds, compiled from regional sources. There will be some variability because of the variety of seed and whether the seed was fully ripe and kept dry in storage. To be certain of your own seeds, you can also do the easy viability test, at the end of this article. You can't do anything to change the life expectancy of different types of seeds, but if you save your own seed or need to store purchased seed, you can keep it fresh for the maximum amount o time by taking these steps to store it properly. Be certain the seeds are completely dry, to the point of being brittle, before you pack them away. Place dried seeds in a paper envelope, to absorb any moisture that might get in, and label with the name and year. Keep the envelopes in an airtight container out of direct sunlight. Here's an easy way to determine how viable your saved seed is and what percentage of it you can expect to germinate. Moisten a sheet of paper towel so that it's uniformly damp, but not dripping wet. Place the 10 seeds in a row along the damp paper towel. Roll or fold the paper towel around the seeds so that they are covered. 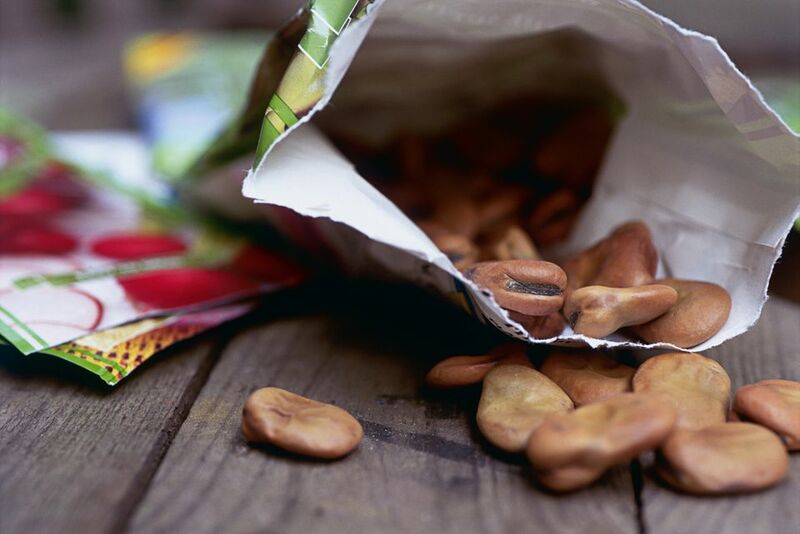 Place the paper towel with the seeds into the plastic bag and seal it. Write the date on the plastic bag, so there’s no guesswork involved. If you are testing more than one type of seed, also label the bag with the seed type and variety. Place the plastic bag somewhere warm, about 70 degrees F. A sunny windowsill or on top of the refrigerator should work. Check daily, to be sure the paper towel does not dry out. It shouldn’t because it is sealed, but if it gets very warm, you may need to re-moisten the towel with a spray bottle. Start checking for germination in about 5 days. To do this, gently unroll the paper towel. You may even be able to see sprouting through the rolled towel. Very often the roots will grow right through it. Check your seed packet for average germination times for your particular seed, but generally, 7 - 10 days should be enough time for the test. After 10 days, unroll the paper towel and count how many seeds have sprouted. This will give you the percentage germination you can expect from the remaining seeds in the packet. If only 3 sprouted, it is a 30% germination rate. Seven would be a 70% germination rate. Nine would be a 90% germination rate, and so on. What Does the Germination Rate Tell You? Realistically, if less than 70% of your test seed germinated you would be better off starting with fresh seed. If 70 - 90% germinated, the seed should be fine to use, but you should sow it a little thicker than you normally would. If 100% germinated, lucky you. Your seed is viable and you’re ready to plant. There is no need to waste the seeds that have germinated. They can be planted. Don’t let them dry out and handle them very carefully so that you don’t break the roots or growing tip. It’s often easiest to just cut the paper towel between seeds and plant the seed, towel and all. If the root has grown through the towel, it is almost impossible to separate them without breaking the root. The paper towel will rot quickly enough and in the meantime, it will help hold water near the roots.